It is time to unveil the gorgeous cover for the final episode of Christine Rains' outstanding 13th Floor Series! Congrats on reaching the conclusion of your amazing series, Christine! I'll be back soon with an explanation of why this is a day late and why I haven't been around much this week. But it is something I'm excited about. In the meantime, have a wonderful weekend! This really is a fantastic cover, just like all the others in the series! And oh, you have exciting news to share? Can't wait! Thank you so much, Nick! Can't wait to here your news. :) And thank you everyone for your comments and congratulations. Christine always has such great covers! Love the cover! The book sounds awesome! Congratulations to Christine - great cover! yes! another one!!! so excited. love the cover! Gosh, I so need extra time in each day so I can read more. I need to add this to the always-growing TBR list. Can't believe it's the final episode in the series! Gosh I'll have to check it out now that all the books are out. What a cool ghost story! And awesome cover. Thanks for sharing this! Congrats Christine... so excited about your series. Congrats! Nice cover, you see the ora sp? Christine's story/ies sound/s incredible. I'll hop on over to her blog. I love the cover! I think it's amazing she wrote so many books while taking care of her three-year-old! Awesome cover-very spooky. 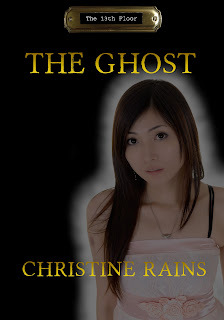 Congratulations to Christine and thank you for promoting fellow authors. I really do love her cover. Been looking forward to this reveal! Oooh, beautiful :) Great expression on her face.